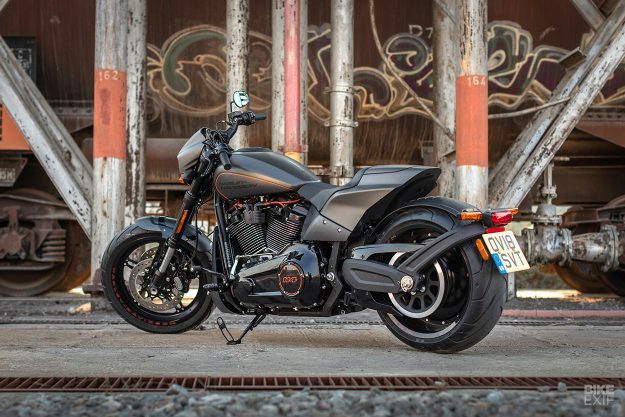 To the casual observer, Harley-Davidson appears to be on the ropes. So there’s a massive expectation with every new bike released: will it be the Hail Mary pass everyone’s waiting for? 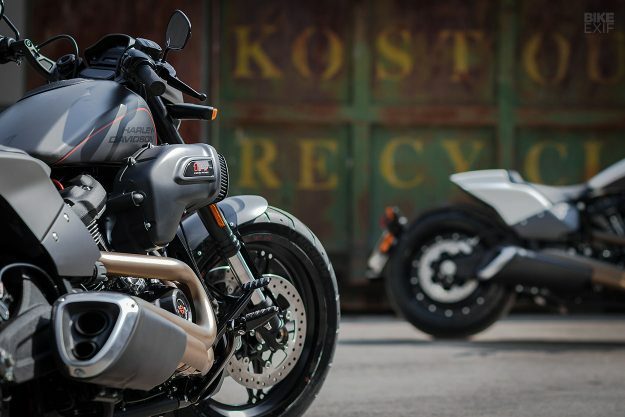 The new Harley-Davidson FXDR 114 is under that intense scrutiny. Revealed hot on the heels of the Motor Co.’s recent four-model announcement, its aggressive styling and claims of superior performance has both detractors and fans fired up. 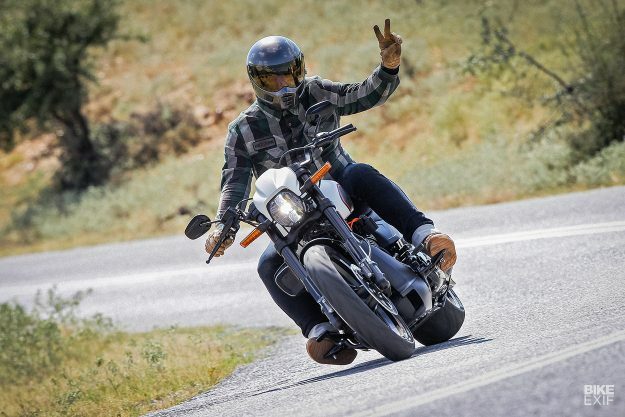 To find out if it lives up to the hype, I grabbed my Biltwell Lane Splitter and my best Dyna Bro flannel, and hopped a plane to balmy Thessaloniki, the second largest city in Greece. 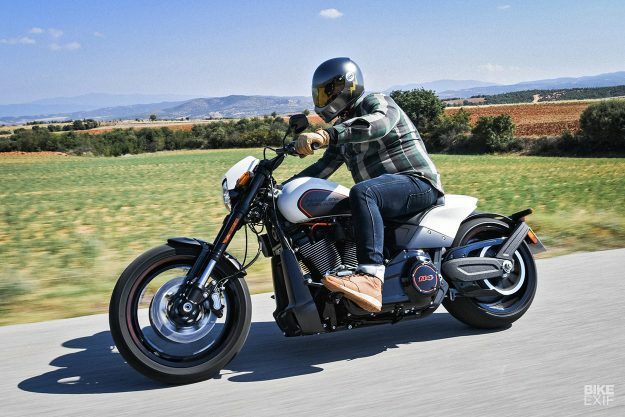 The FXDR 114 is the tenth model in Harley’s new generation Softail range. 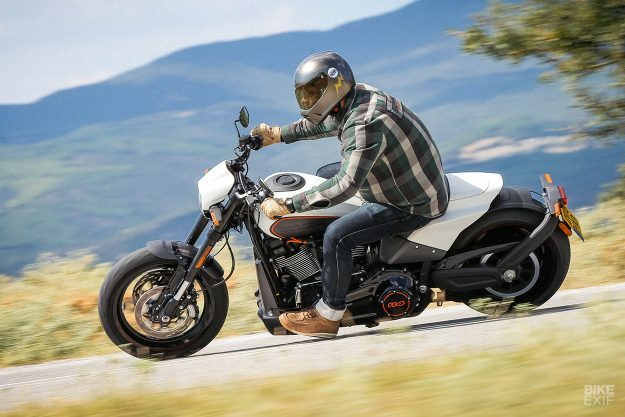 So it shares the same chassis and Milwaukee-Eight power plant—with a few upgrades thrown into the equation, and a fresh, radical aesthetic. 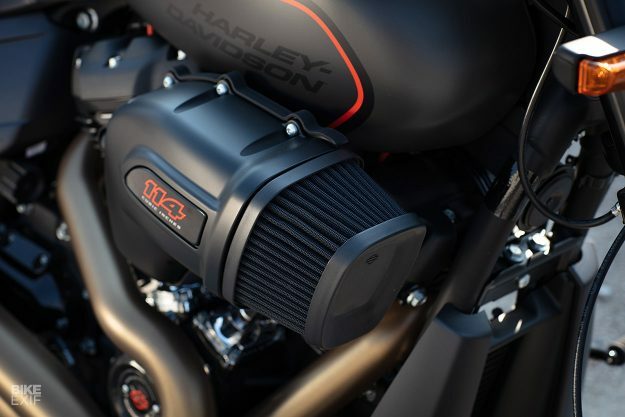 That means it gets the 114 ci (1,868 cc) version of the Milwaukee-Eight V-twin, good for 162 Nm of torque at 3,500 rpm. (Power is likely to be around 90 hp at 4,500 rpm.) It also has a unique intake, inspired by Harley’s own drag bikes. It’s designed to enhance airflow, and it uses a synthetic material that shrugs off rain and doesn’t need oiling. 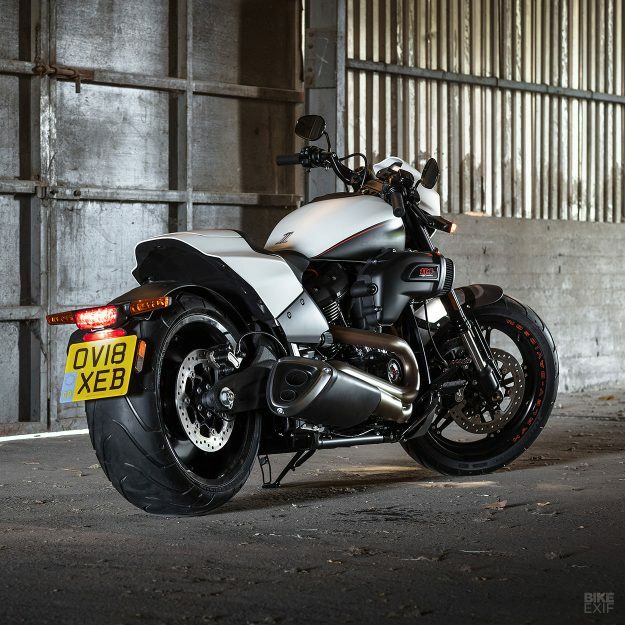 The drivetrain’s rounded off with a chunky two-into-one exhaust, with an angular design that has less chance of hitting the deck in corners. And it sounds pretty throaty too. Harley-Davidson has worked hard on the geometry too. They wanted to keep the raked out look of the Breakout, but improve handling. So they pulled back the trail to 120 mm; 25 mm less than the Breakout, and 12 mm less than the entertaining Fat Bob. The front end gets 43 mm inverted forks, and a 19” front wheel for quicker turn-in. Out back, Harley switched out the Softail’s steel swing arm for an aluminum one that’s 10.2 lbs lighter. And they moved the mount for the (preload adjustable) shock, effectively raising the rear end and improving both ground clearance and lean angle. The FXDR now has more lean than any other Softail, at just under 32 degrees left and right. The rear wheel is the same 18” / 240 mm whopper as the Breakout—a mandatory feature on this style of bike. Both wheels are aluminum, as is the subframe, and even the strut that holds the rear tail light and plate assembly. As for the tail section, that’s built out of a composite material. Why all the comparisons? Because the FXDR’s price asks a lot of it. Starting at $21,349, its upgraded bits make it the most expensive in the Softail line. But it’s also the most progressively styled, and that’s probably the biggest clue to its purpose. 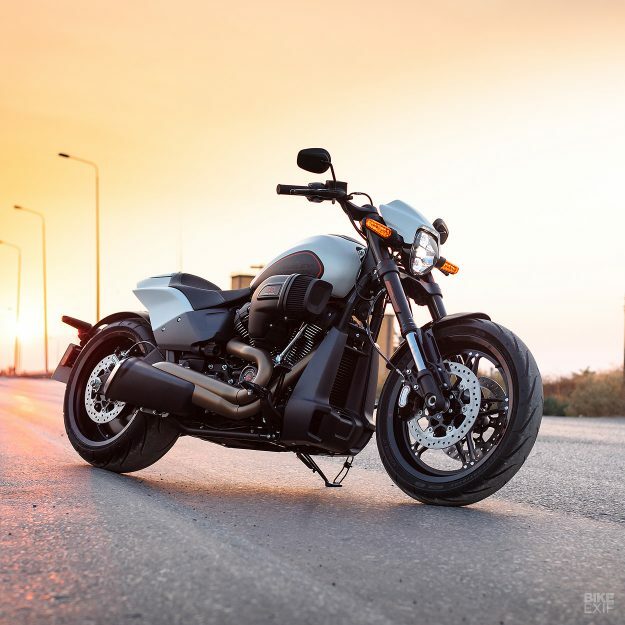 At the press briefing Ben Wright, chief engineer for the Softail platform, said that the FXDR’s design is a bridge between the current Softail range and the upcoming Streetfighter. So it’s a great snapshot of the Motor Co.’s thought process. Look at it from the front, and you’ll see the angles on the headlight shroud echoed on the air filter and the edges of the radiator covers. Peak behind that screen, and you’ll see the same tiny LED speedo as the Street Bob embedded behind it. 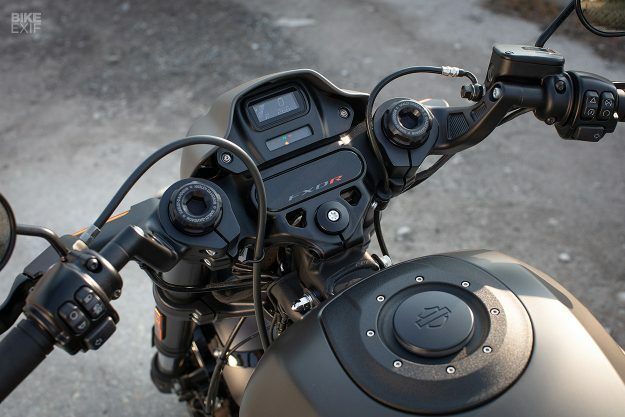 The FXDR’s raised clip-on handlebars keep the cockpit neat and open, and a removable plate reveals regular riser mount points, if you’d prefer to fit different bars. The 4.4-gallon fuel tank is all-new too, with a more sculpted look than the other Softails. 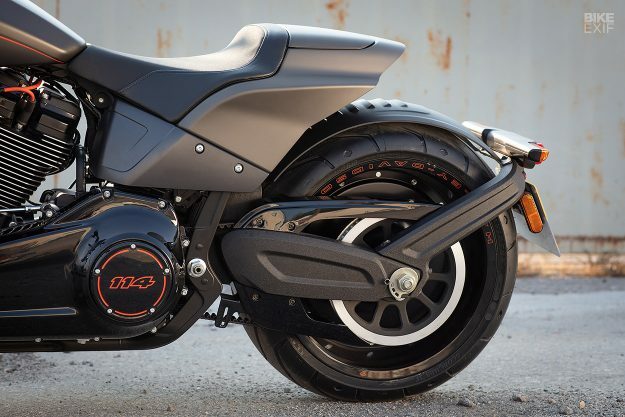 The FXDR wears it well, along with that oversized intake and angular exhaust. I don’t even mind the ridiculously large turn signals, and ugly-yet-compulsory bits like the rear mudguard are easy to bolt off. What’s more, every last part feels primo to the touch. We had four of the six paint options on hand, and they all looked top-class in the light of day, with little orange highlights (right down to the spark plug wires) adding to the muscle bike feel. There’s a USB port too, and a panel on the tail that pops off to reveal a small cubby (and a mounting point for a pillion pad). 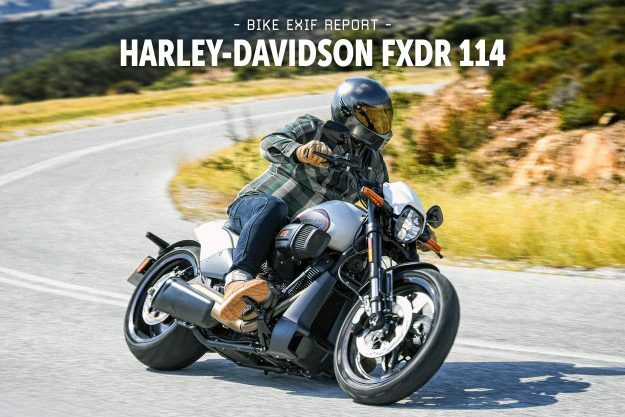 But swinging a leg over the FXDR 114 quickly revealed a weakness: ergonomics. With forward controls and low bars, I looked and felt like a regular badass on it. But out on the road, it limited how good the FXDR could be. Whacking the throttle open had the FXDR pulling off the mark like a freight train. 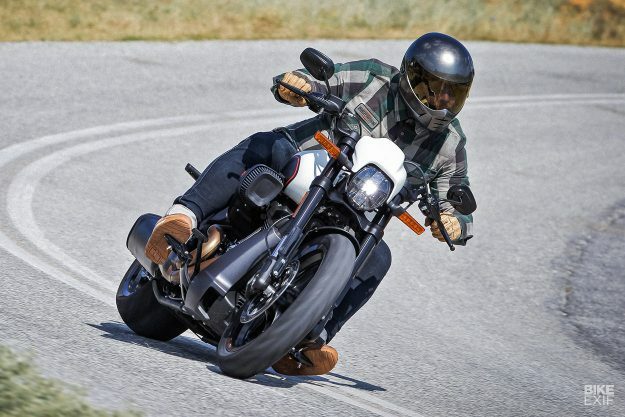 With no traction control to rein it in (when asked, Harley said it was in the works for future models), getting the rear to breakaway and squirm was as juvenile as it was fun. The riding position worked a treat here: all I had to do was hang off the clip-ons, feet out, with the scooped seat tucking me into the bike. But the pressure on my back and wrists made riding it a chore by the end of our 150-mile ride. It also meant I had to work harder to shuffle it through corners. The shape of the seat made it hard to shift my weight around in the saddle, and harder still to hang off the side. With my feet out front I couldn’t rely on them for steering, and my arms were too stretched to get my elbows out. There were a few corners that I went into way too hot, and had to slam brakes and scramble to correct myself, pronto. But once I managed to adapt my riding style, I started to see the results of Harley-Davidson’s handling tweaks. That 19” front wheel does turn in easier, and the bike feels incredibly planted once it’s in a turn. 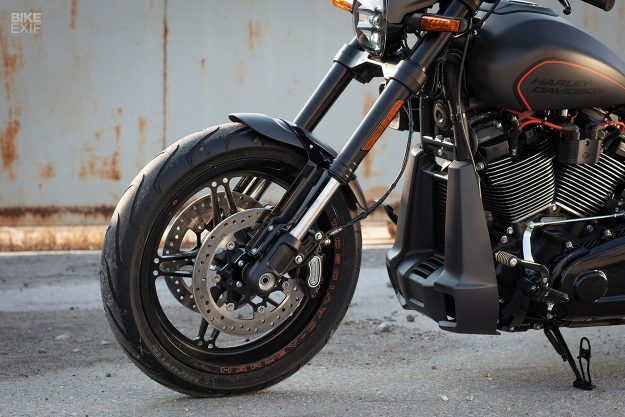 On the Breakout, that fat rear wheel feels disconnected—but on the FXDR it works in unison with the front. The chassis is stiff and predictable, and the increased lean angle actually makes a difference. I managed to put peg to pavement a grand total of once—but I did grind my boot heels frequently. Just like I reported when I first rode the new Softails, power delivery from the 114 ci Milwaukee-Eight mill is thick and smooth. So it’s a hoot to power it out of corners. One of the H-D staffers on our ride pointed out that he could stick with me into turns (he was on a different bike)—but that I dropped him coming out of them. 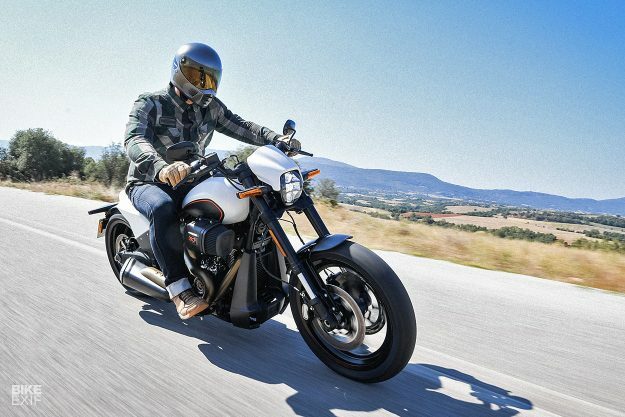 The rest of the drivetrain’s no surprise: the clutch is light enough not to tire you out, the gearing is spot on and the FXDR’s twin 300mm, ABS-equipped front stoppers got me out of trouble more than once. All in all, it’s a rowdy, fun ride. But that goofy riding position stops me from really loving it. 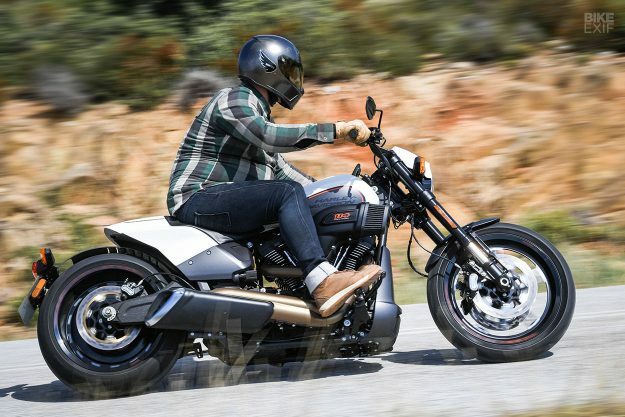 And, honestly, that’s OK. Harley-Davidson is clearly pitching the FXDR 114 at riders who value power and styling more than all-out canyon carving ability. So if it’s trying to prove anything, it’s that Harley-Davidson are out to build something for everyone. 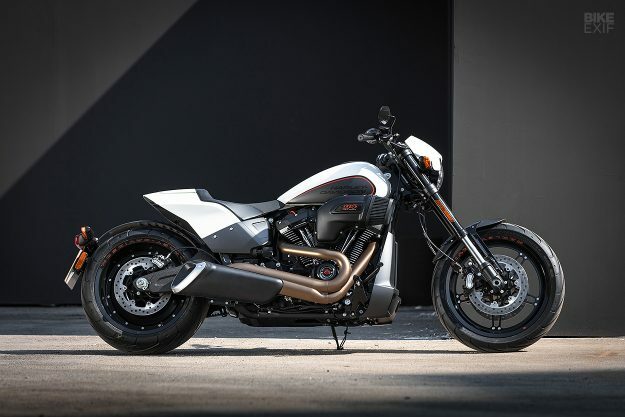 It does have me thinking though: what if Harley-Davidson applied the FXDR 114’s upgrades to, say, the Fat Bob? Or what if similar ideas are lurking under the hood of the upcoming Pan America, or the Streetfighter? Interesting times in Milwaukee, no doubt.